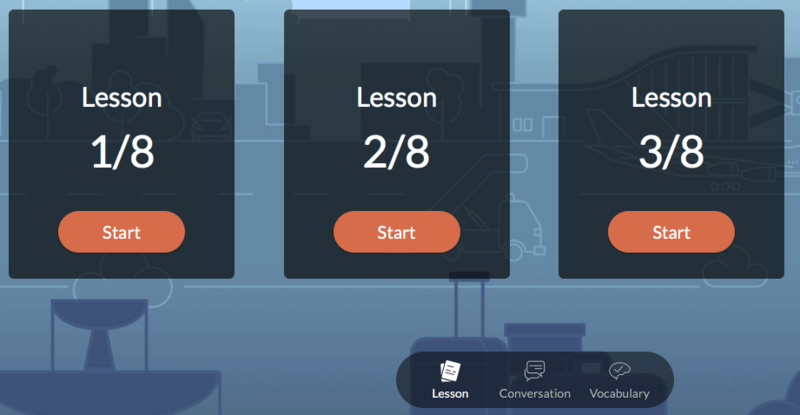 In this review I will explain the advantages and disadvantages of the language learning platform Mondly. I will examine how to practice a language with Mondly. 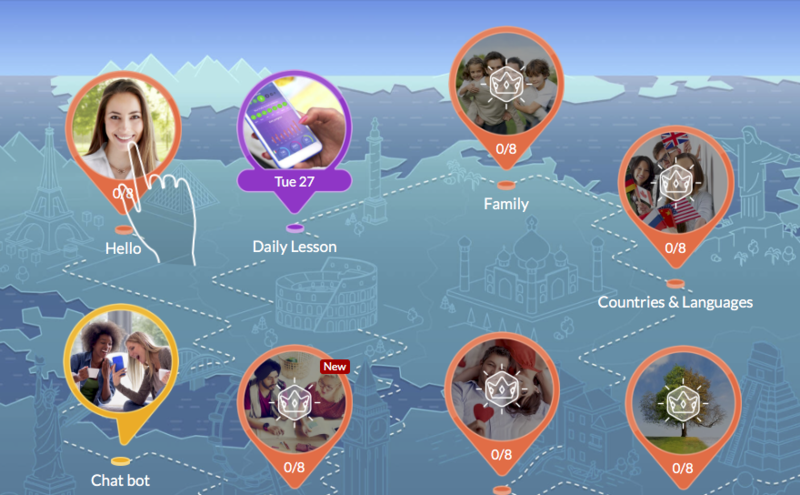 Below, you will find an in-depth review about Mondly as a language learning platform. I will discuss the value Mondly brings to students, for which levels it is suitable, what packages are offered, some drawbacks you can find within it, and where to sign up for starting up on Mondly. Recommendable: In general, recommendable for language learning. 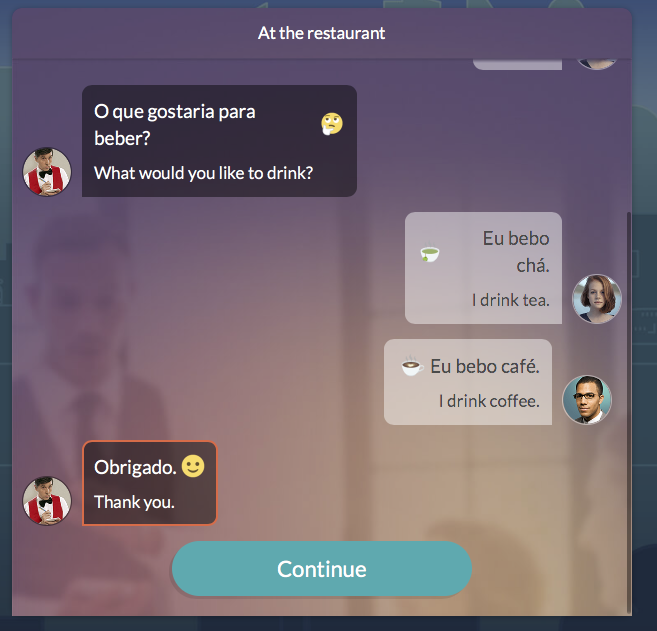 Limited functionality for European Portuguese (lessons mostly in Brazilian Portuguese). Before you get too disappointed by the fact that there are only lessons for Brazilian Portuguese, read my review and consider to test the platform nevertheless. Apart from the audios (that are quite different to the European Portuguese accent), you have anyways quite a lot of words that are equal in both versions of Portuguese. Next, I will explain every point in more detail. 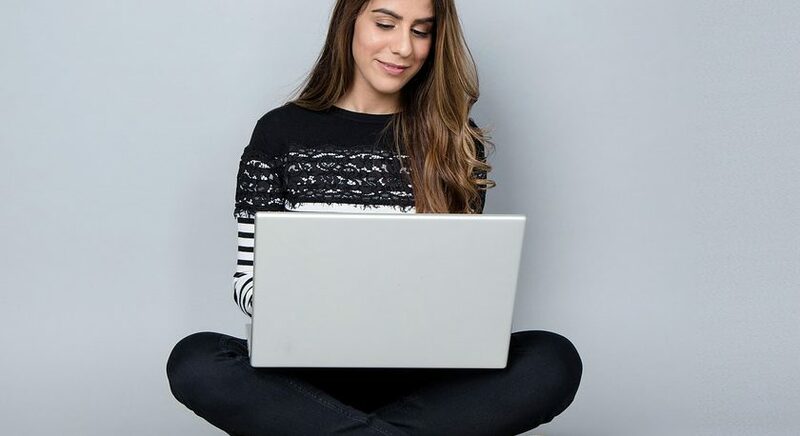 By the end of this review, you should have a good idea whether Mondly is the right platform for you in order to study a new language or to continue enhancing your knowledge about a language you already know. Mondly offers 33 languages and its biggest advantage is that you can learn not only from English to your desired language, but also from your native language to your preferred language (in case it is one of the 33 languages offered). The language app works both on your mobile and on a laptop. Mondly is even available for VR, since last year! The sign up process in Wyzant is quite straightforward and fast. It will only take you a few minutes. First you have to go on the website of Mondly and add both your native language and the language you want to study. By clicking on Start Learning you will be forwarded to the lessons. Once you picked your favourite language, you can immediately start with the free lessons. As you can see there is one lesson available for free, as well as a chat bot and a daily challenge. The other lessons are only available after you purchase a paid subscription. Clicking on a specific lesson will show you the content of this lesson. Within the lectures you have different exercises. There are specific exercises for conversation, vocabulary, grammar, etc. There is quite a good mix of exercises, so there will be for sure something you will like and most of it is made very well, so it can bring you value while studying a new language. Monthly works with a subscription system. Once you are subscribed (on a monthly or yearly basis), you will get access to all the lessons of the Premium Account. I think this option makes sense especially in the beginning if you are not sure if you want to spend more money on Mondly. Just check out the features of the premium account and decide afterwards if you want to subscribe for longer. If so, you might want to check out option 2 and 3 below. Purchasing option 2 will give you access to all the lessons of the language you want to study. Compared to Option 1 you can save some money as you will pay more or less 4 Euro per month instead of 9,99 Euro. Clearly, this option makes more sense than the option number 2, as you will get 33 instead of only 1 language for the same price. This is a promotion (90% OFF) and as far as I saw, this promotion is always there whenever you go on the page for the first time (if needed, delete your cookies). So if you want to subscribe for one year and save a lot of money, Option 3 is what you want to purchase. Please note one important detail that I discovered when going to the purchase page. All the options are subscriptions and are automatically extended for one more month if you don’t unselect the “Enable auto-renewal for this order” option. So do not forget to do this if you do not wish for an automatic renewal of your subscription. Flexibility: You can use the app either on your mobile phone or at home on your computer. This way, you will also be able to study while travelling, in the train, or wherever and whenever you feel like. Interface: It is easy to navigate between the lessons and within the menu. Audios: There are very good audios provided to students. Mixed approaches to learn the language: Exercises for vocabulary, grammar, listening, reading, writing and speaking. Track your progress: Nice reports about your daily successes. Mostly no articles for nouns. Most of the lessons only available after you make a purchase (monthly / yearly subscription). You can always give it a try and practice with the free lessons. 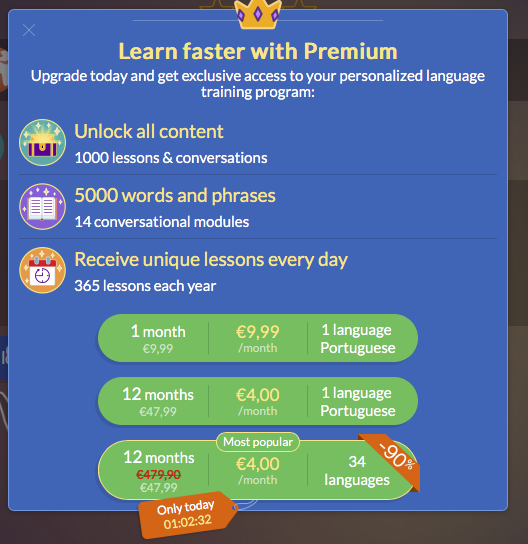 If you like the language learning platform you can always upgrade to a premium account. First things first: I can definitely recommend Mondly as a learning tool for students that want to learn a new language. However, as the lessons for Portuguese are in Brazilian Portuguese, I can only recommend the app to a limited extent for learning European Portuguese. It might be okay for a beginner to get to know some vocabulary. For audios, grammar, etc. please refer to other resources. The European Portuguese lessons should be updated with new audios (European Portuguese accent) and adjustments to the grammar should be made. Is it worth a shot? It is! If you are still not sure, I suggest you give it a try. Sign up and get to know the interface. Try the free lessons and decide then if you want to purchase the premium version or not. You can find a lot of certifications received by Mondly directly on their website. For further reference, you can find some reviews online, e.g. on TrustPilot. Honestly speaking, Mondly is in my opinion a good tool to study a new language. However, it is not the perfect platform to study European Portuguese. The reason for this is that the European Portuguese lessons offered are in Brazilian Portuguese. Nevertheless, you can use Mondly in order to explore new vocabulary and to get a good overview on Portuguese. Just keep in mind that this is the Brazilian Portuguese variation of the language. I would suggest that you use Mondly as a training tool and combine it with proper tutoring lessons. You could check out Wyzant Tutoring or iTalki, for example. Alternatively you could also have a look at language courses e.g. Pimsleur or the Mimic Method. The most important thing to keep in mind during your whole journey learning Portuguese is: HAVE FUN WHILE STUDYING AND USE EVERY OPPORTUNITY YOU HAVE TO SPEAK THE LANGUAGE. I hope you liked my review about how to practice a language with Mondly. If you have any questions or you want to add some useful information, feel free to leave a comment. I will reply as soon as possible. In case you already have experience learning a new language on Mondly, I would appreciate if you would leave your feedback below. Wow, I’m glad I ran across this. I am gonna give it a shot. I have been looking at different options for learning a foreign language, however most of the options have been cheesy or over priced. Like say, Rosetta Stone. I was not a fan of the price on the program at the book store, and i’m not sure if it’s even mobile. This seems to be reasonably priced for what you get. After learning with this, what would you suggest for refining my noun skills? Did you manage to give it a try with Mondly? If so, how was (or is being) your experience? You can also try another platform called italki – you can find all about it in Learn European Portuguese online on italki. If you want to try a course online, you can also try my own course – Course A1 – Learn European Portuguese Online. The advantage of it is that it is cheaper when compared to online classes and you can always pause, go back, etc. I am still going to upload the rest of the lectures for the A1 course. At the moment I have two lectures in there. Hi Mia, thank you for your Mondly review. I guess it depends whether you want to learn European or Brazilian Portuguese. I wasn’t aware of the differences. Can you explain a little more? Also, can a Portuguese person understand a Brazilian person and vice versa? Which Portuguese is the better starting point? Yes, in fact there is a slight difference between European and Brazilian Portuguese. If you want to know all about it, check my post about it Brazilian Portuguese vs European Portuguese. Brazilians and Portuguese can understand each other. It is a bit like American English and British English. I would say both options are good – either start with Brazilian or European Portuguese. However, if you start learning European Portuguese, it tends to be easier afterwards to understand Brazilian Portuguese. This is because Brazilian Portuguese sounds are generally easier to learn than European Portuguese.